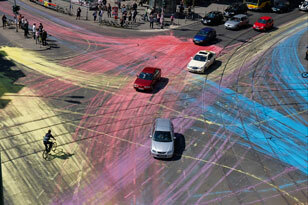 More and more artists chose to create art in public space, use it as a public stage, or try to actively change it. 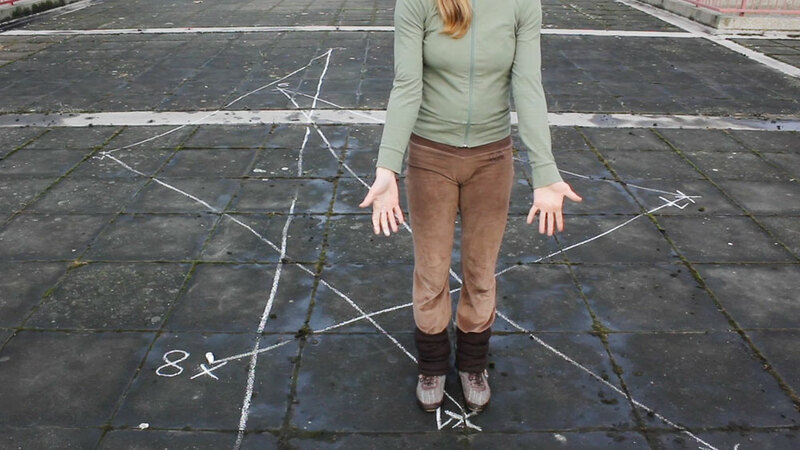 An "invisible performance", invisible, because it has not been publicly announced, may not physically change a place, however it may change the ideas of how to use public space in general. 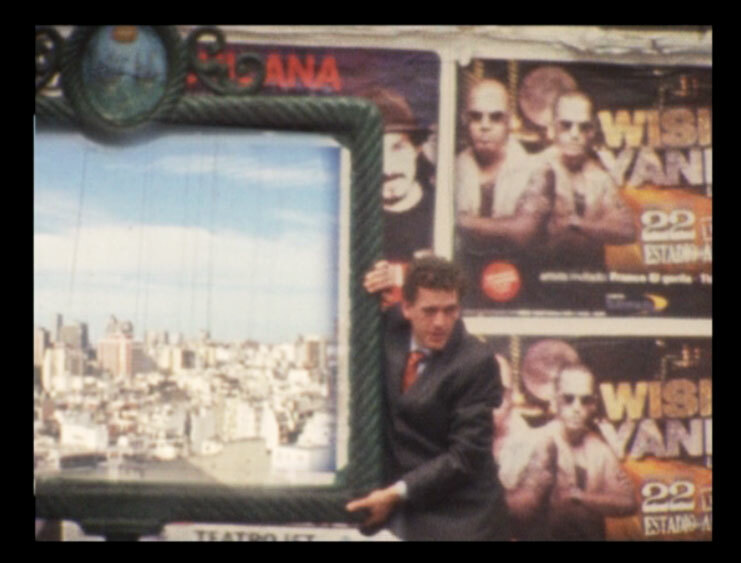 Filipe Afonso's film Televisao is a (secret) filming of private spaces, where nothing more happens than the nightly projection of a television screen, and he questions the differences between public and private sphere. Laura Kissel records a specific situation. "Window Cleaning" in Shanghai shows two facade-cleaners, who become public performers with their high-up activities, but also possible unwanted witnesses of private scenes. Kika Nicolela confronts people in places where usually no cameras are allowed, and where instead surveillance cameras always record. 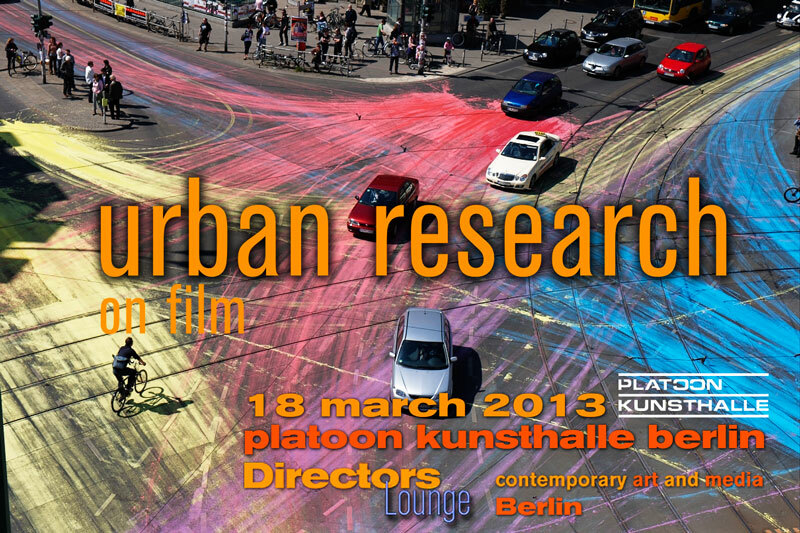 Urban Research is a film and video program curated by Klaus W. Eisenlohr for Directors Lounge 2013. Urban Research encompasses explorations of public space, the conditions of urban life, and interventions in the urban sphere, by international film and video artists using experimental, documentary, abstract, or fictive forms. In a subway stop, two people await, in the middle of the crowd, the arrival of the subway. Upon its' arrival, the crowd disappears. On the ends of the station, both stand still, and, as the subway leaves, they walk to meet each other. They approach, join their bodies and the dance begins. Buenos Aires in the 19th and in the 21st century. Part one of a trilogy about appropriation of public spaces. In this rapid accelarating and highly complex world Katze und Krieg discover the slowness and the simplicity in the daily life of urban space. They celebrate very easy actions. They ask passerbys to film them. What happens, when the presence of Katze und Krieg interferes with our noisy functional rushy daily citylive? A conversation with two window washers who were hanging off the edges of my apartment building in Shanghai. 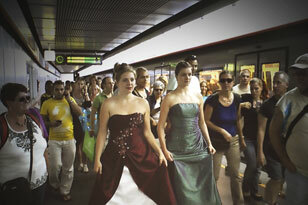 Jakominiplatz in Graz is a main junction of public transport. It may be considered as a Non-Place according to Marc Augé. The public intervention creates temporary and personal local relations, an implementation of places into the non-place, thus endowing a new place construction. Through fragmented narrative and dance performance, Image of a City explores the tangible relationship between architecture and the body. With the collaboration of all artists of Traffic Jam, the idea behind this video is to challenge and disturb (with humor) the sense of authority and question the random rules and limitations on public/private audiovisual recording. Sculptures of bulls appropriate cows during the Cow Parade event in av. 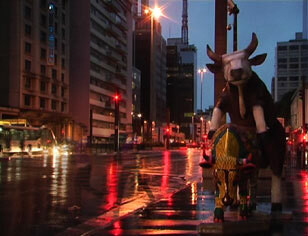 Paulista and av. 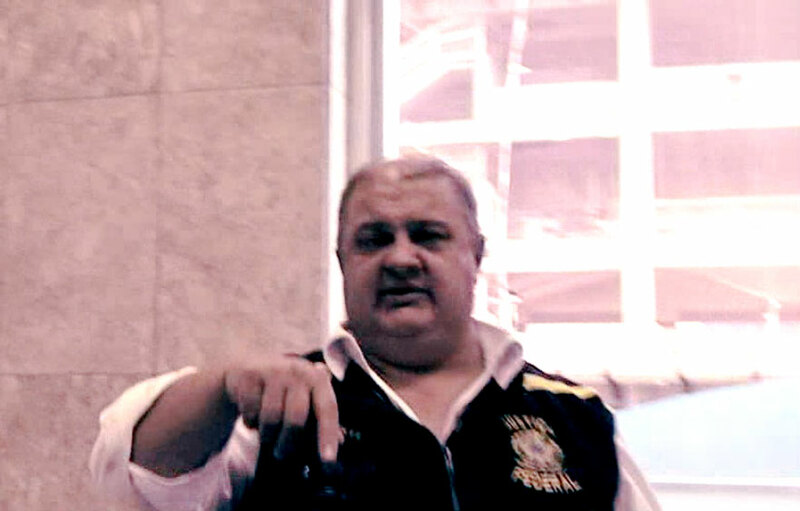 Faria Lima in Sao Paulo. The Touro Bandido is rescuing the Brazilian imagination, an animal that has never been tamed and has become a national legend. 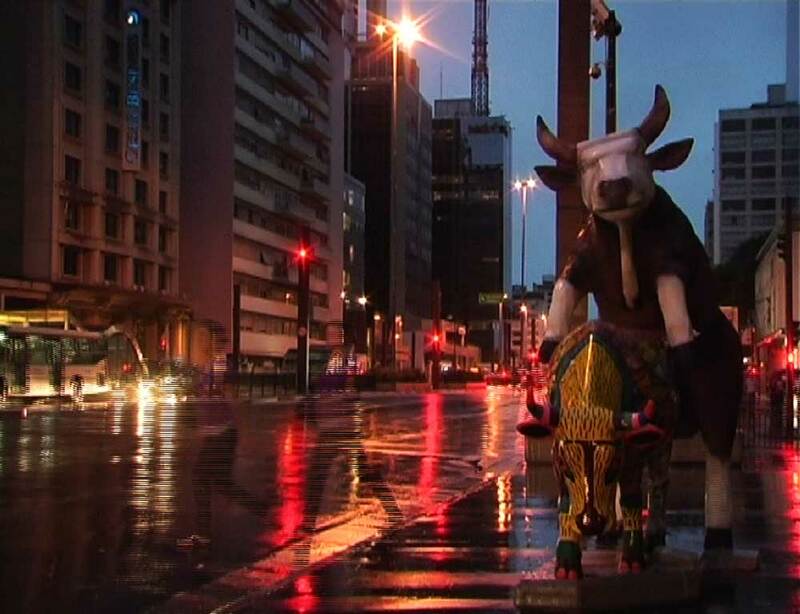 For the artist, "both the cow and the bull were sterile but the insemination created art in it." Live intervention by IEPE and The Anonymous Crew on Rosenthaler Platz Berlin 2010. At the end of the 90s the term NEUE MITTE/ NEW MIDDLE was introduced in German politics by the former chancellor Gerhard Schroeder. Conservative as well as left wing politicians regarded people of the "new middle (class)" as their target group. But the term itself stayed totally undefined. Public intervention. 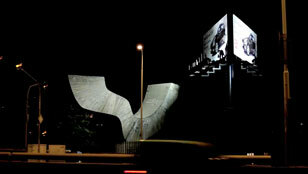 The artists reinstall the lights for a big advertisement board, and use them for lighting the forgotten highway sculpture "Equilibria" from sculptor Josef Klimes. 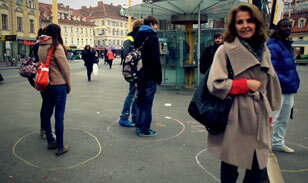 Action in public space, Prague 2011. 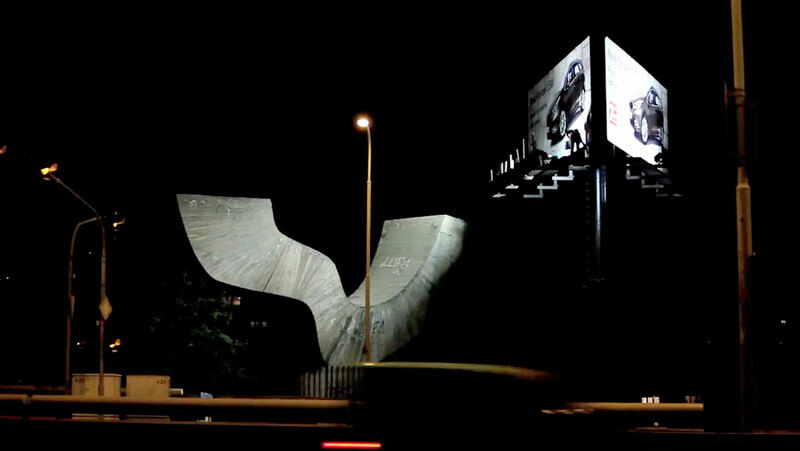 A commercial billboard turned into different use.